← Decorating with Martha. Not. “A MOVIE IS BEING MADE IN OUR TOWN?! 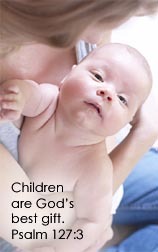 !” was heard a lot this summer in our community. I found it fascinating that any movie would be filmed in our tiny, little town. 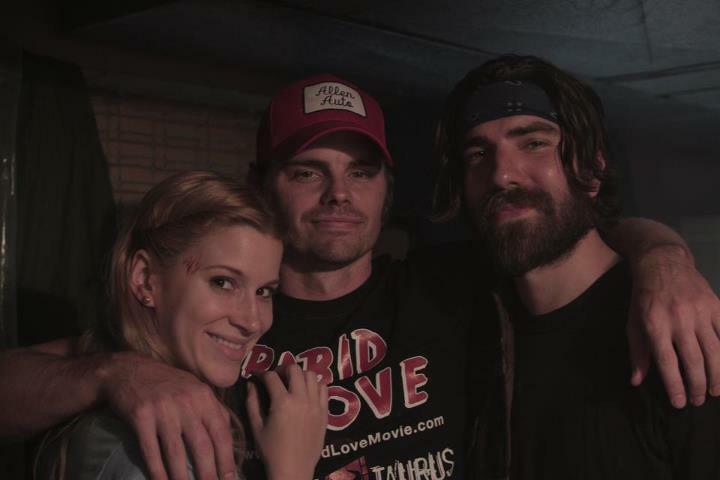 But with volunteer work, cooperation and organization from the community and hard work from the cast and crew, the Rabid Love movie was completed like other projects our community has undertaken. In fact, this film’s team of about twenty, including Lance Ziesch and the movie’s director and screenwriter, Paul J. Porter, filmed and wrapped the movie in a month’s time and ahead of schedule! 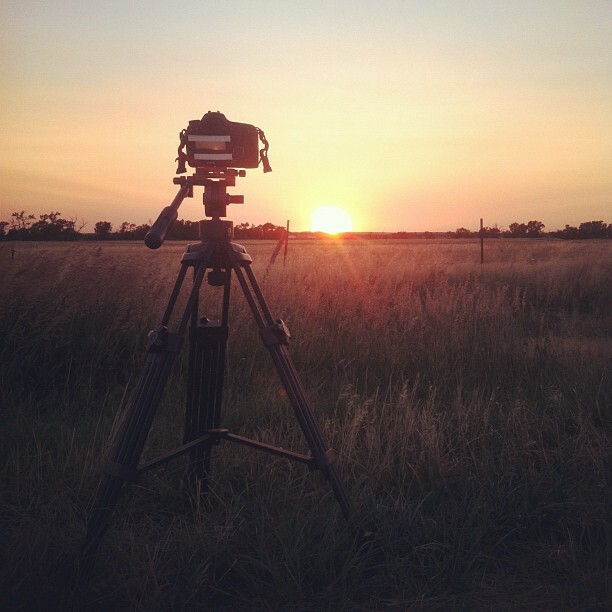 So, I invited the Production Designer of the movie Rabid Love, Lance, over to talk about the movie…who, by the way, is a hometown boy, a longtime family friend, an amazing Christian who served as a missionary a few years ago in Australia and Ukraine, and is currently a graphic artist at a regional farm and ranch newspaper, “The High Plains Journal”. Me: So Lance, how did you get involved in this project? Lance: I first heard about Rabid Love in a local newspaper article, having no idea a movie was going to be filmed in our backyard. Immediately, I contacted Paul through Facebook. Although we had never met, we were distant cousins and I mentioned that I had always wanted to work on a period movie. He responded right away that he could probably find work for me in his art department. A few days later, he promoted me to art director, although I wasn’t sure what an art director actually did! One of the first things that Paul mentioned was nailing down filming locations and finding 1984 vehicles and other props. 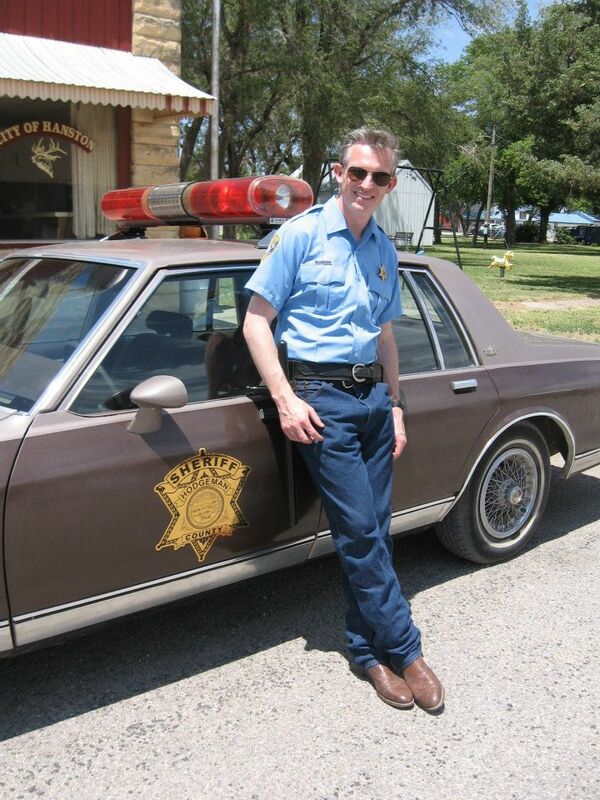 Brian Reece aka Sheriff Francis Sinclair, leaning on a restored cop car! Photo courtesy of Lance Ziesch. Me: And you found the cars? Lance: It was really hard to find cars from that era because 1980 cars weren’t known for their durability and chic design. Any car in that era would need to look brand new in our movie. But I did find some usable ’80’s cars and went back to some 1970’s cars…muscle cars like Cameros. Me: How did you jump into this unknown territory of movie making? Clifton’s General Store shot from inside the gas station two months before filming. Photo courtesy of Lance Ziesch. We already had permission to use the old restaurant/store. And that was the start. Paul being the writer and the director for Rabid Love, had the whole movie in his head….like the palette of colors needed to actually look like 1984, orange, avocado, yellow and browns. You can’t match everything, but the dusty red color of the store and the sandstone of the station were perfect! The technique used to film the movie will mimic that era…the heyday of the teen horror movie. Night shot of Hayley Derryberry. Photo courtesy of Rabid Love on Facebook. Me: How and why did Paul decide on our town for the movie location? Lance: I think cost was a huge factor due to a small budget and Paul knew he couldn’t compete with the high costs of filming in California. So he looked at our little town and figured out that it is still residing in the 1980’s!. Another reason was family support as his grandmother lives here along with many cousins! 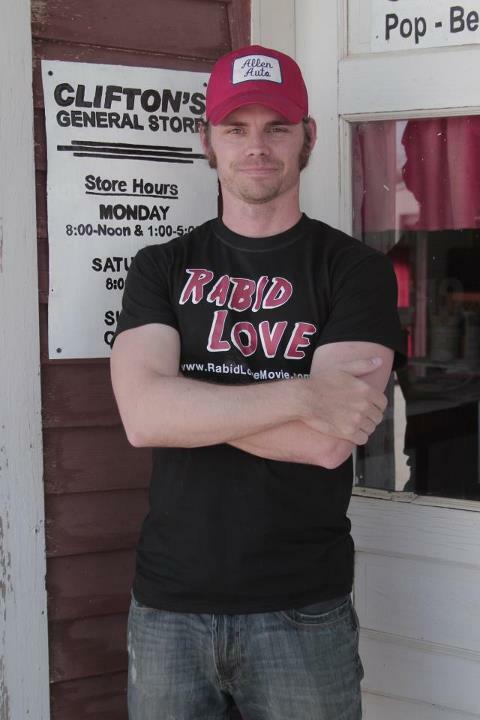 Paul J. Porter, writer & director of Rabid Love. Thanks to Rabid Love on Facebook. Me: So Paul wrote the screenplay? Lance: Yes, along with his wife, Hayley, who also stars in the movie. 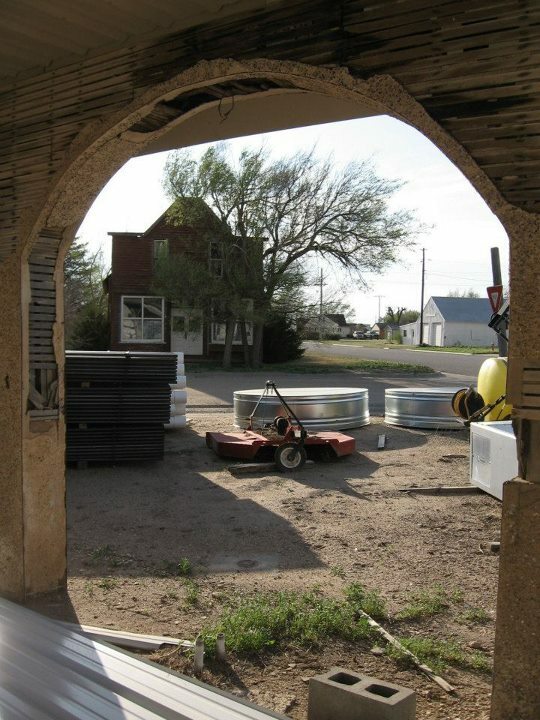 Me: There had to be all sorts of hurdles to overcome filming in a small western Kansas town?! Lance: Yes, getting the California cast and crew here with their gear was something to consider. And scheduling the shooting days was key as some actors would need to come and go during the shoot depending on where other acting jobs they might be involved in were. It helped that Paul sent letters out to area film schools offering opportunities for work experience. So we had three interns from the Colorado Film School here. A lady who lives in town wrote Lance on FB that she hoped her barking dog didn’t mess up their filming the night before! Thanks to Rabid Love on Facebook. Me: Your job evolved from art director to production designer. What’s the difference? Lance: The production designer is the head of the Art Department. The production director meets with the producer and director of photography to help determine the visual feel of the movie. Mark Furini came in that capacity but he graciously wanted me to have that title as I had unknowingly been doing the job already. 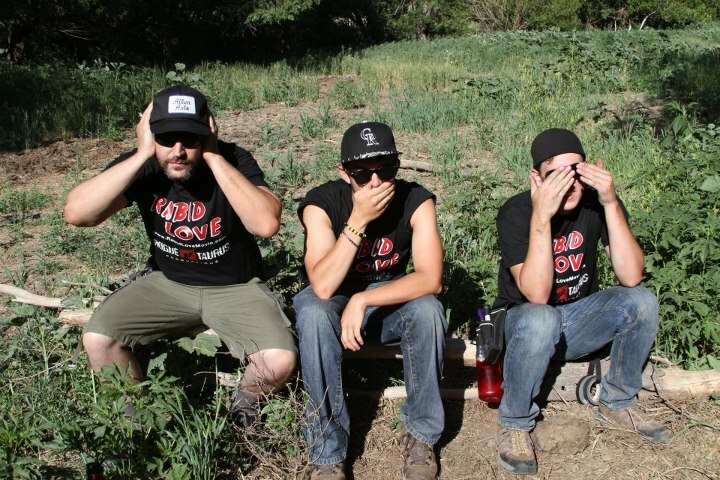 joking around on set at the Ziesch Farm during the first day of filming. Thanks to Rabid Love on Facebook. Me: What was the most challenging day on schedule? Me: Of all the props, what was the hardest to find? Lance: Several were challenging. I had a list of Holy Grail finds…bread bags from the ’80s, dishwashing bottles, shaving cream, etc. But the plastic bread bags were tough. Those were usually thrown away. I finally found them in a burned-out house, intact. 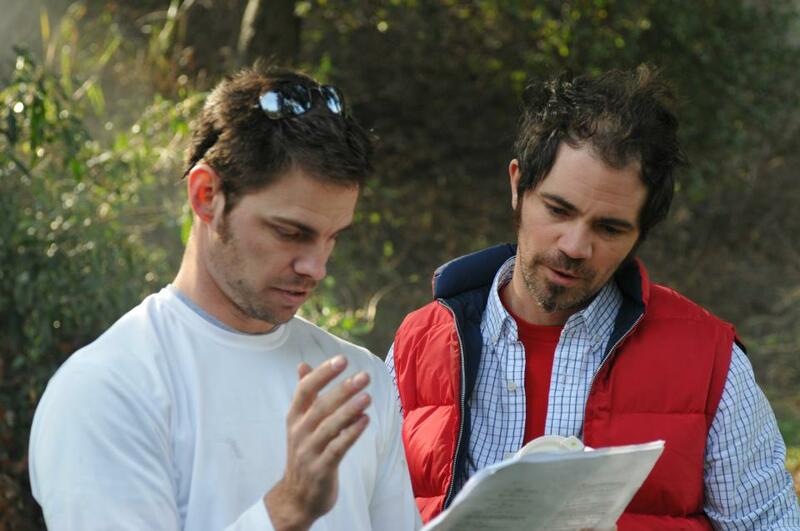 Paul Porter and Josh Hammond going over a shot during the filming of the Rabid Love short, Dec. ’11. Photo courtesy of Rabid Love on Facebook. Me: A burned-out house?!! Where else did you find props? Lance: I’ve always been interested in anything vintage. So I sat down and thought about who the hoarders were in this community? The answer was my family! I found lots at my grandma’s house. One night I was speaking at the local museum about the movie, Titanic and my sister’s involvement as an animal trainer in that production. The audience wanted to know what I was doing with Rabid Love. When I told them , they said that they had things that I could use as props and the museum made the same offer. So I took them at their word and later borrowed a cookie jar, a candy jar, a cash register, a display case, a gas station sign and pump that had the same company logo and countless other items. 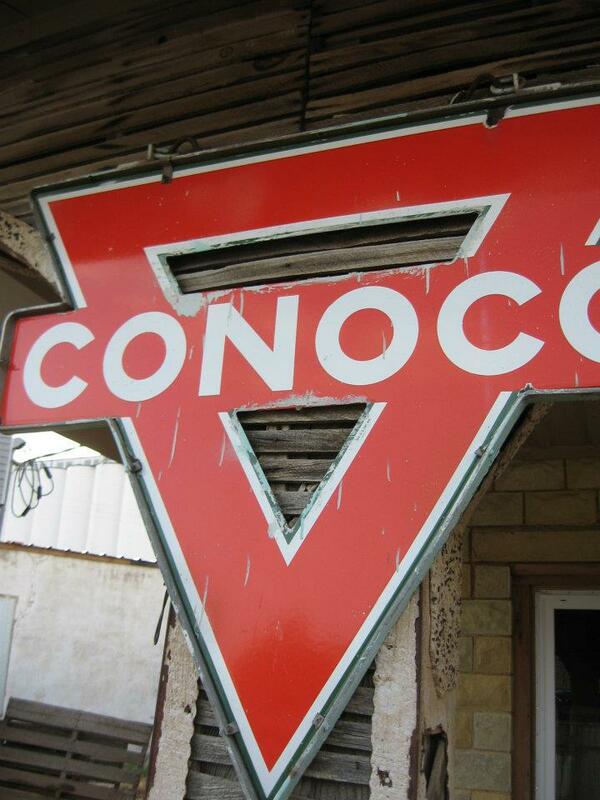 Conoco sign thanks to the Haun Museum. Photo courtesy of Lance Ziesch. Me: What was your most exciting “find”? Lance: I might have actually yelled when I found a can of Aquanet hairspray in my grandma’s house! And it was full! Another one that was incredible was a full, intact six-pack of Coors beer in the original paperboard carrier. Me: I hear you had to come up with your beer brand? Eventually, we found some retro-look bottles and bought two cases! Because the original bottles had red tops, I had to spray paint each cap orange. The cast and crew were told they could drink the bottles of beer but they hadn’t better lose the bottles or caps!Everyone was walking around worrying about keeping all the caps! 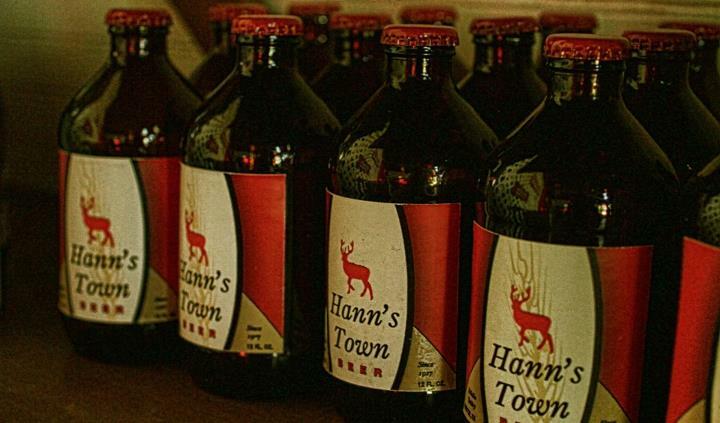 Hanns Town beer bottles as designed and photographed by none other than…Lance! Me: So being a “detail” person helped? Lance: Definitely! I kept thinking that I wanted people, when they see the movie, say “I remember that!” So I had to keep asking, if I walked into a 1984 gas station, what would I see on the wall? What would be on the counter? So, I found 1984 calendars, counter checks, phone books, etc. 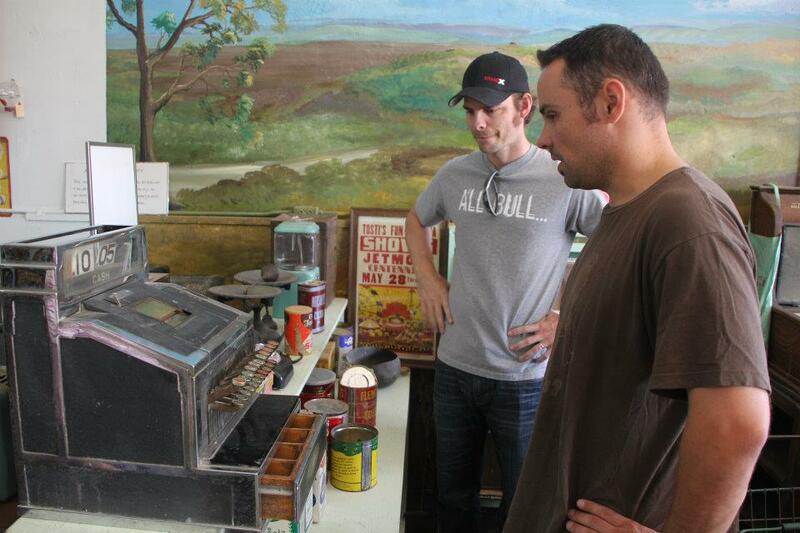 Paul and Lance at the Haun Museum prior to its delivery to the general store set. Photo courtesy of Jeremy Yam. Paul’s Angels, starring Hannah Landberg, Hayley Derryberry and Jessica Sonneborn. Photo courtesy of Rabid Love on Facebook. Me: When will Rabid Love be released and will there be a premiere? Lance: Right now, we’re in post-production. We hope to have the trailer ready for Halloween and the final version by next spring or summer. “Premiere” isn’t a word we’ve been throwing around but we have talked about a screening and that is planned for Dodge City. Me: Is there anything of interest to the general public within our community that they might like to know? Lance: Yes! There was a big debate about the name of the fictional town. Originally, it was named Eagle River. In my search for props, I kept finding calendars, phone books, etc. that were Hodgeman County specific. When we decided to use my grandpa’s sheriff badge, it was marked with “Hodgeman County”. That decided it. After the consolidation of the Hanston and Jetmore school’s to become Hodgeman County School, we wanted make sure that we didn’t risk any division in the communities at this point. With my past ties with the Hanston school, I had vintage Hanston items. Unfortunately, the available Hodgeman County items looked too modern…because of the newness of the school merger…like T shirts, license plates. A good example of the Hanston vintage items was Aaron (his nephew) leaning against the Red Malibu wearing a Hanston Elk letter jacket. Lance: Me: What have we not talked about that you’d like folks to know? Lance: It was a good really positive experience! The cast and crew were a lot of fun to be around and a lot of them have been involved in larger projects which makes it kind of shocking to me that they’d spend a month in our town! Hayler Derryberry, Paul Porter and Brandon Stacy. Photo courtesy of Rabid Love on Facebook. Me: If Paul called tomorrow to see if you’d help in his next movie, you would say…? Lance: Ha ha! That call has already come! And I said, “Yes!” His next project is Dark Desert, which isn’t necessarily a horror movie. It’s on a larger scale, more involved, and the sets are more complicated. It may be partially filmed here. The script called for a pheasant to be shot in one of the scenes, but that presented a problem for us. Pheasant season was months away from the script time setting and we couldn’t legally shoot a pheasant in May! Everyone here knows that here! So I talked to Brad (my #2 son) and he thought he had one in his freezer. But as it turned out, roadkill solved the problem! It was a gift from God! 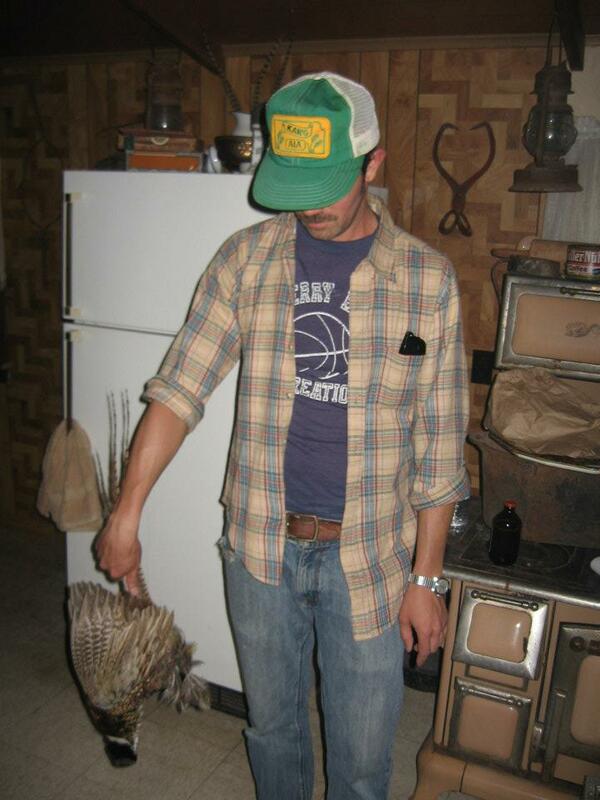 Josh Hammond holding Ferdinand, the Pheasant.Photo courtesy of Lance Ziesch. Last day of shooting Rabid Love. Thanks to Rabid Love on Facebook. This entry was posted in Entertainment and tagged Ali Lofquist, Brandon Stacy, Brian Reece, Chris Bylsma, Dark Desert, gas station, Hannah Landberg, Hayley Derryberry, Hollywood, Jessica Sonneborn, Joe Backer, Josh Hammond, Lance Ziesch, Mark Furini, Megan Hensley, Natalie Turner, Paul J. Porter, props, Rabid Love, vintage. Bookmark the permalink. Very impressive, Queenie! Hobnobbing with movie directors, production designers and such! ;D How fascinating and fun for your community. When you left us hanging after your first mention of this project with all the vehicles and strangers descending on your town, I had this crazy idea that ‘Dark Skies’ was relocating to your town!! Can you imagine?!!! LOL!! I thought that might be what some of you crazy people thought!! Gotcha! It was fun!! The movie-making and the interview! !